Update: I’ve had a lot of requests for the pattern that I used for this scarf. Here is a link to the yarn and patten on Ravelry. It was a lovely yarn to work with, I highly recommend it! 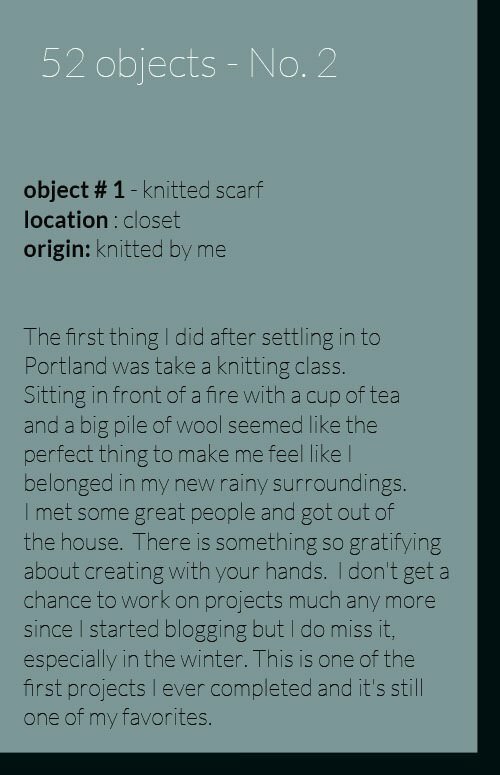 I would love to see any projects if you decide to knit one for yourself! When I first moved to Portland nine years ago I was in a very different place in my life and I was definitely in the mindset that I needed more. More space, more stuff, more everything. When we bought our house we had the expectation that we would fill it with another child and we thought that one or both of our mothers might be living with us. Today it’s just the three of us and it makes me a little melancholy to realize that we weren’t able to make the dream of another baby come true. So as I wander around this house that is way too big, filled with things that don’t mean much to me I have to admit that I’m ready for a clean start. Looking through closets and getting rid of stuff also allows you to look at things that you haven’t seen or thought about for awhile. Taking stock of my stuff makes me remember that for a time I was a knitter and that I loved it. It’s odd how we go through phases in our lives and how something that can consume all of your free time suddenly loses importance and you drift away from it. Knitting was hugely therapeutic for me and it allowed me time to sit and be quiet without any distractions or interruptions. There is something so satisfying about creating something where there was nothing before. I hope that I find the time to pick up my needles again but for now at least I have this beautiful scarf to remember that time in my life. I love it! Makes me want to learn how to knit! You should totally do it. I never thought that would be something I was interested in and I tried it because I was bored. There is something hypnotic about watching that ball of yarn turn into stitches and then into something you can wear! What a beautiful first project! You have many talents! 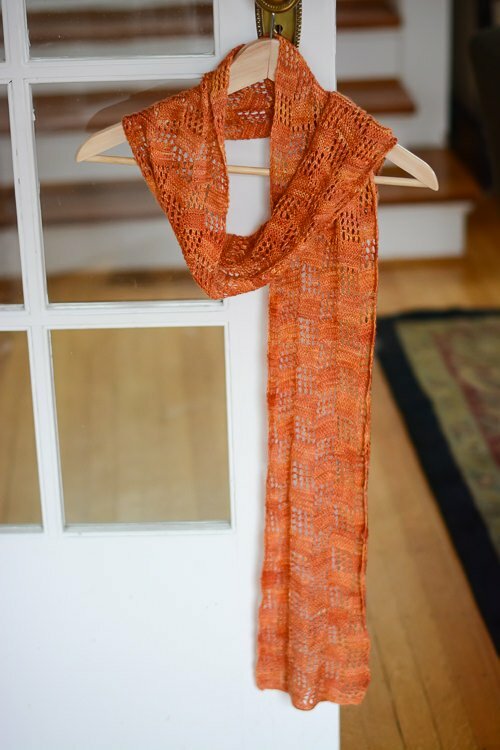 Please share directions for this beautiful scarf. Beautiful. I would love to have the pattern. Are you able to share? Here is a link to the pattern and yarn that I used for the scarf. It’s a lovely yarn to work with, just a little slippery. Hope you like it! 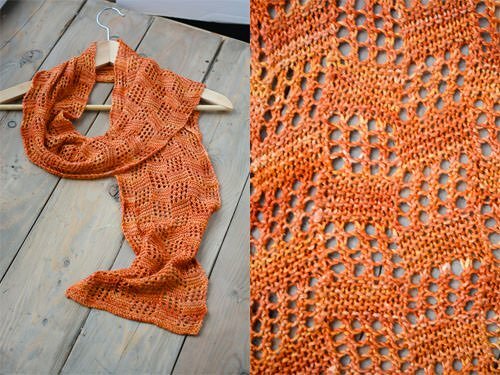 Could you please post a link to the pattern and yarn. It is gorgeous!! Since I’ve had quite a few requests for the patter and yarn I’ve put up a link at the top of the post. It was a lot of fun to knit! Beautiful first project! I have wanted to learn to knit and having trouble decided on what to knit first. You helped make that decision! You should give knitting a go. I find it super relaxing and it’s a great way to pass the time, especially if have a lot of time when you are waiting around!